Art is an essential part of every community, helping to reveal the nature of a place and its people. McMinnville has a vibrant community of local artists and makers, and we’re proud to be able to share some of their work with our guests at the Atticus Hotel. Supporting and promoting local art is not only one of our core values, but also a part of our commitment to share the story of our community with our guests. Throughout the hotel, our art–which is both exclusively local & original– has been curated around the theme of dreams, which are sometimes ethereal, sometimes disjointed, and always revealing. Like the Atticus Hotel itself, our art collection sets the tone for a deeper experience of McMinnville and the rest of the Willamette Valley. Oil painter Zachary Hixson utilizes light and color in his textured, often dramatic pieces. Based in McMinnville, Hixson is inspired by the endless stretches of rolling hills and moody skies that make up Oregon wine country. The cloud series commissioned for our rooms at the Atticus Hotel has a dreamy, otherworldly quality. Born in Costa Rica, Borrasé has art in her blood thanks to her talented painter grandfather. She moved to McMinnville in 1987 before fine-tuning her unconventional painting style and ultimately co-opening Pura Vida on Third Street, where her work is displayed. Carmen’s paintings draw the viewer in, holding their attention with a collection of seemingly unrelated objects, in the same way, that dreams often coalesce around objects and ideas that are out of context. A staple in the McMinnville art scene, Affolter specializes in oil and pastel paintings and photography. The landscapes she captures behind the lens are vivid while her paintings are wispy and bucolic as if lifted from a dream. Co-owner of local outfit MAC Sign Painting, Mitch Horning is a self-taught painter and lettering artist born and raised in McMinnville. His detailed signage has a special place in the heart of the Atticus Hotel, where there’s a distinct nod to vintage typography and the journalistic ways of old. Basile’s Workshop has turned meticulously salvaged materials into beautiful custom furniture, fixtures and millwork since 2012. The outfit’s keen eye, respect for old architecture and painstaking reconstruction fits hand in glove with the Atticus Hotel’s genuine reflection of time and place. Type A Press started with an idea from Proprietress Chelsey Nichol–her company officially launched when she decided to take an old letterpress from the warehouse of her family’s fourth generation newspaper and printing business and learn to print. Over the last seven year’s Type A Press has created beautiful handcrafted paper goods, including many custom jobs for the Atticus Hotel. The word Trouvaille means “a valuable discovery, or a lucky find”and Sarah Voss of Trouvaille Made & Found Life Style Shop makes more than just ‘lucky finds’—she also hand makes beautiful products as well. Her macrame’ plants holders are featured in every room at the Atticus Hotel, helping to weave texture into our spaces. Born on the Oregon Trail and embedded in the Pacific northwest ever since, a pioneering spirit helps chart our course at the Atticus Hotel. More than a mindset and the beautiful lands that surround us, this sense of discovery extends into the contents of each and every room. 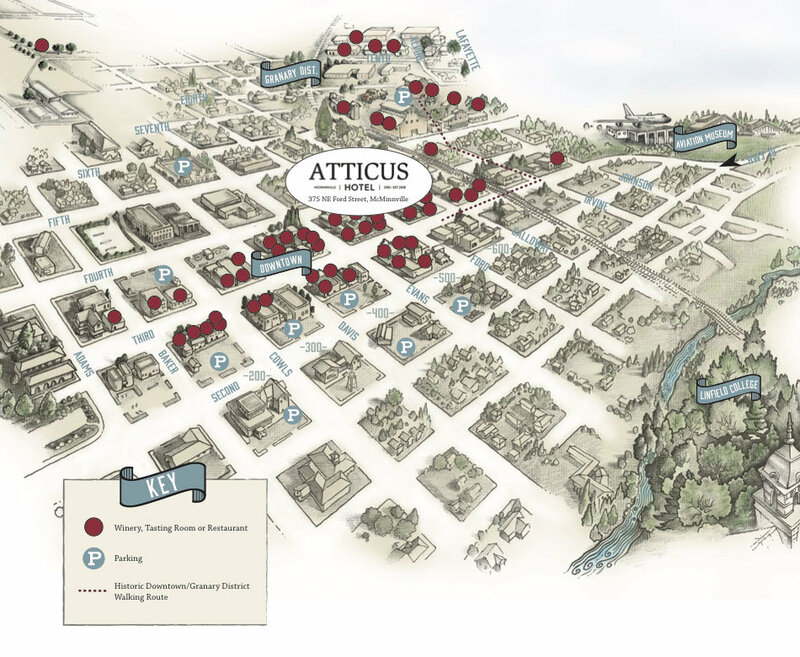 Incorporating the work of some of Oregon’s most iconic brands allows the Atticus Hotel to paint the entire portrait of the Willamette Valley with genuine authenticity — and leave you savoring every locally-wrought detail. It’s in our DNA to reflect our location, so it’s only natural that we’ve called upon some of the best makers who share that very philosophy. Since 1863, Pendleton Woolen Mills has crafted durable, eye-catching quilts, throws and garments. The eastern Oregon based outfit’s Native American-inspired patterns and luminous use of color make it one of the most recognizable brands around. The tile and stone specialists at Ann Sacks have been personalizing dwellings since 1980. The Portland company’s distinctive selection and deftness of design are big reasons why every room at the Atticus Hotel is a bit different. The period piece lighting experts at Schoolhouse Electric have been at it since 2003. Having mastered a clean and contemporary take on nostalgic fixtures, the Portland company’s lamps, sconces, chandeliers and more are seminal local accents. Portland-based Juju Papers specializes in made to order wallpaper hand-printed on sturdy, environmentally sound parchment. The ageless patterns, textured design and soothing color palette make for lively interior backdrops that can shift the mood of entire buildings. Makers of modernist lighting from Oregon City, Cedar & Moss has been stylishly illuminating rooms since 2013. The sleek, geometric designs are a melding of a mid-century mindset with a contemporary twist. Rejuvenation has produced vintage lighting and housewares since 1977. The Portland company excels at every interior accent, from restored treasures to door knobs, mirrors, upholstery and more. Using nature as its muse, Portland’s Maak Lab develops wildly aromatic soaps, salves, essences, and candles. Their creative work adds to the many sensory delights on display at the Atticus Hotel. Crafted in nearby Newberg, Restonic Mattresses has been supporting dreams by crafting the highest quality sleep products since 1938. Based in nearby Tigard, the team at Madison Furniture are experts in upholstery, turning out sophisticated chairs, sleepers, benches and ottomans. A refined living space calls for their durable, well-crafted work.